NEW YORK, N.Y., Nov. 7, 2013 (SEND2PRESS NEWSWIRE) — EaseUS, with ten-years of research and development experience in the field of data recovery, now newly promotes a brand new product – EaseUS PhonTunes – an iTunes music transfer software which enables all Apple device users to transfer music from Apple devices to iTunes, a computer and to import music from other devices to Apple devices. This is definitely a great breakthrough which makes it easy to transfer music from iPod to iTunes; not a troublesome issue but an easy and enjoyable fast process for music lovers. 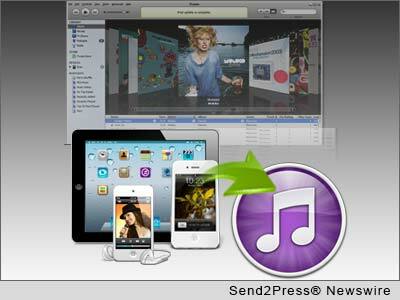 This new music transfer software provides all Apple devices users a convenient method which is compatible with various OS such as iOS 7, supporting Windows 8.1/8/7, Vista and XP. It supports various Apple devices such as iPhone 5s/ 5c/ 4S/ 4, iPod 4/ 3/ 2 and iPad etc., being able to satisfy Apple devices users’ various needs such as how to transfer music from iPod to iTunes. Being different from other music transferring tools, EaseUS PhonTunes entitles Apple devices users more choice and a broader way to select exact songs to transfer instead of exporting all data or music files on iPod, iPhone or iPad to iTunes. Hence, it enables users to enjoy music from other devices such as some music files which could not be found on iTunes and EaseUS PhonTunes makes it possible to add music to Apple devices directly without any obstacles. This great breakthrough is due to the new algorithm which was worked out by excellent and professional EaseUS researchers who are the essential part of producing such a fabulous software. The core feature of EaseUS PhonTunes is that it realizes the dream of music anywhere for music lovers, which produces three transferring paths to export or add music among different devices such as iPod, iPhone, iPad, iTunes, My Computer or other devices such as MP3, CD, memory card etc. Syncing music is no longer the only path to share music on Apple devices and iTunes, EaseUS PhonTunes provides more interesting method to transfer music. Besides, this amazing music transfer tool thoroughly avoids the dilemma for overwriting the original data which may undoubtedly be encountered while syncing. Music anywhere is no longer a slogan with EaseUS PhonTunes, which now makes it a reality with newly advanced technology and enables music lovers to transfer music from iPod to iTunes without any obstacles. Furthermore, this is a 100 percent clean and safe music transfer tool which makes music transferring process an even more interesting and enjoyable process but not a troublesome issue any more. EaseUS Software is an innovative software developer which dedicates to delivering the best software products and services of data security and storage management to the worldwide consumer and business market segments. Millions of people spreading over 180 countries are now using EaseUS’ products and all speak highly of EaseUS’ software and service. For more information, please visit: http://www.easeus.com/. Press release text provided by EaseUS. Original Keywords: EaseUS Software, EaseUS PhonTunes, iTunes music transfer software, CHENGDU Yiwo Tech Development Co., Ltd., ipod, music library EaseUS Software New York New York NEW YORK, N.Y.
REFERENCES: Apple Mac and iOS News, EaseUS Software, EaseUS PhonTunes, iTunes music transfer software, CHENGDU Yiwo Tech Development Co., Ltd., ipod, music library EaseUS Software New York New York NEW YORK, N.Y.